Warning: Protect Flint from further harm. Keep Predators Like Willie Gary Out of Town! 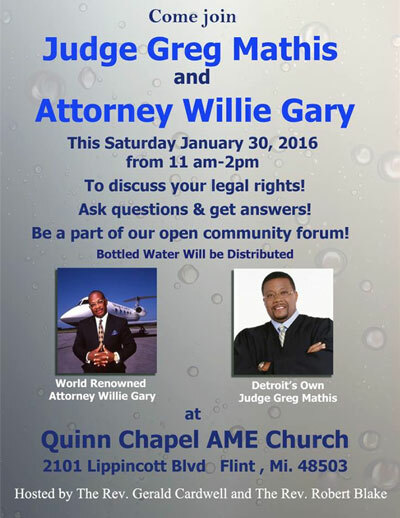 A number of Flint residents joined by labor and human rights advocate Ray Rogers, director of New York City based Corporate Campaign, will attend the church forum at Quinn Chapel AME Church from 11am to 2pm on Saturday. "We are participating in the forum not to watch Gary try to solicit clients," said Rogers, "but to serve as a voice for the many clients he has defrauded." 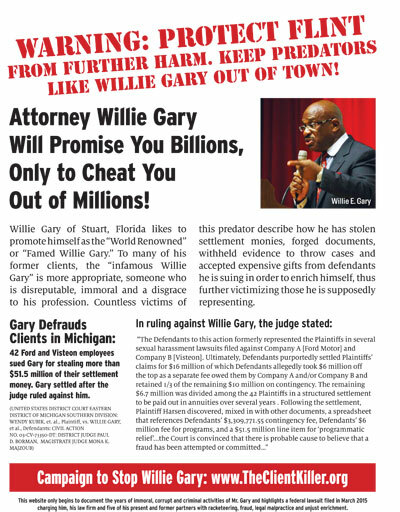 Flint residents who have friends and relatives that claim they have been defrauded by Gary will be distributing flyers to attendees headlined "WARNING: PROTECT FLINT FROM FURTHER HARM. KEEP PREDATORS LIKE WILLIE GARY OUT OF TOWN! 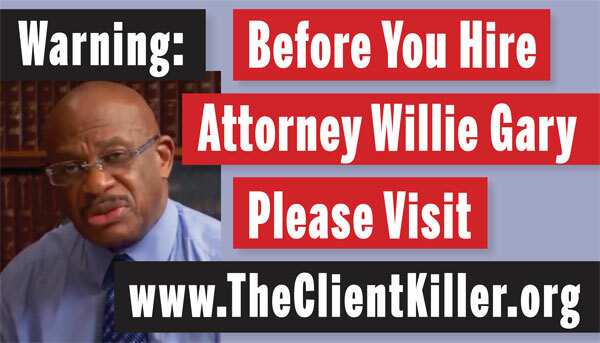 Attorney Willie Gary Will Promise You Billions, Only to Cheat You Out of Millions!" The flyer directs readers to a website, http://TheClientKiller.org to learn more about the "immoral, corrupt and criminal activities of Mr. Gary." 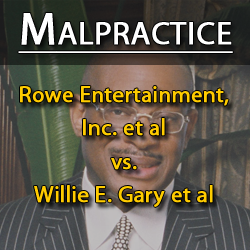 Gary, his law firm and five of his present and former partners including disgraced former Atlanta Mayor Bill Campbell, are presently being sued in federal court in Georgia for racketeering, fraud, legal malpractice and unjust enrichment in Rowe Entertainment, et al. v. Willie Gary, et al. Plaintiff Leonard Rowe stated: "The question that keeps coming to my mind is why attorney Willie Gary is still allowed to practice law. He should have been disbarred and imprisoned years ago for the destruction of lives he has caused. Attorney Gary, in my opinion, is detrimental to the American public and a disgrace to the legal profession. He can rest assure that I will not stop until he is held accountable for the deplorable and criminal actions against not only his clients, but against humanity as well. 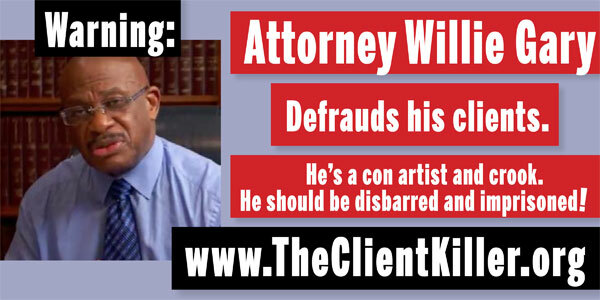 I hope that Flint residents will not fall prey to his fraud. 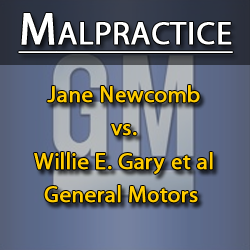 Former General Motors executive, Jane Newcomb, a 30-year veteran of the corporation, affirmed, "For many former clients, including me, the decision to hire attorney Willie E. Gary has been the mistake of a lifetime." 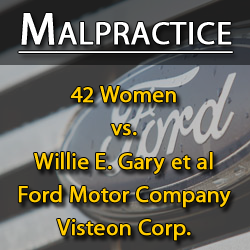 What could be most damaging to Gary's reputation is the irrefutable evidence disclosed in the flyer and on the website describing how Gary defrauded 42 Ford and Visteon employees, all woman, out of more than $51.5 million. 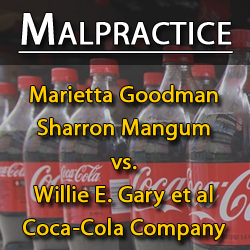 Gary settled that case after the judge ruled against him and stated...the Court is convinced that there is probable cause to believe that a fraud has been attempted or committed..."
Plaintiff Harsen immediately informed [Gary's colleague] Curt Rundell, who stated that, if Company A, Company B, or Willie Gary knew that Harsen had "their case[-]closed files, with all that information, ...[Harsen] could find [her]self in a body bag." After Harsen's husband asked Rundell what the $51.5 million was for upon handing Rundell the spreadsheet the following day, Rundell replied that "the $51.5 million was money Willie [Gary] was to receive from ...[Company B] for programs." 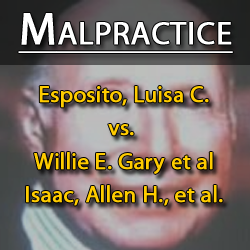 When questioned whether this was legal, Rundell stated that Willie [Gary] is doing things that no other attorney has thought of doing and[,] believe me, he has himself covered." Excerpt from Long Island Backstory regarding Willie Gary's corruption. Gary Jacobs, investigative reporter for Americans For Legal Reform based in Long Island, New York, produced a half hour news video, "Exposing the sham known as the Commission on Statewide Attorney Discipline," for Long Island Backstory to help expose corruption rampant in our "legal system." The following two minute segment of Ray Rogers commenting on the corrupt activities of Willie Gary and his law firm is excerpted from that story which first aired on August 16, 2015. The video resulted from Mr. Jacobs' coverage of the August 11, 2015 hearing in New York City on the New York Attorney Discipline System. Mr. Jacobs can be contacted at: GaryLJacobs@aol.com.Watch the full report on YouTube. 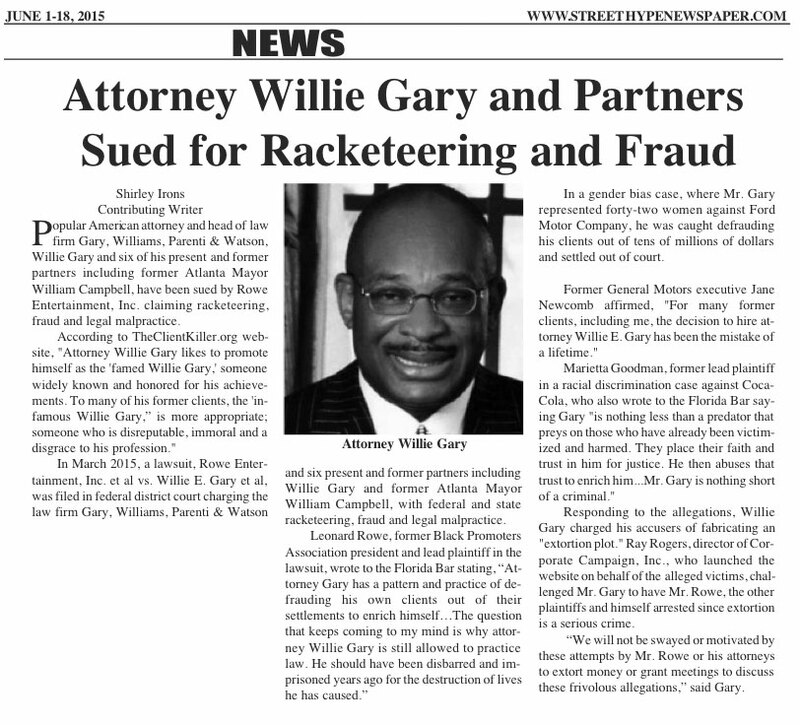 "Attorney Willie Gary and Partners Sued for Racketeering and Fraud"
"Response to Attorney Willie Gary's 'Extortion Plot' Accusation"
Summary: Attorney Willie Gary has accused those involved in filing and promoting the recent federal lawsuit charging him, his Stuart, Florida based law firm and five present and former partners with racketeering, fraud and legal malpractice of an "extortion plot." 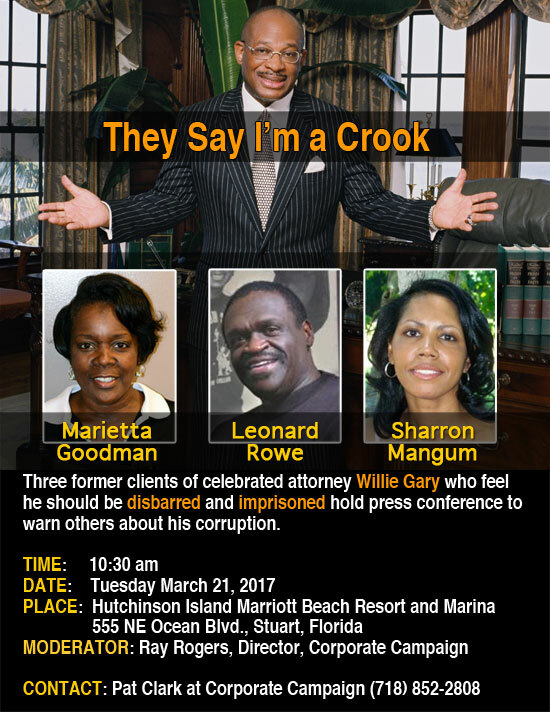 Corporate Campaign, Inc. Director Ray Rogers has challenged Mr. Gary to have lead plaintiff Leonard Rowe, others involved in the case, as well as himself, arrested since extortion is both a federal and state crime. Mr. Rogers has posted evidence in the form of a judge's order which sheds more light on Mr. Gary's and his law firm's corrupt practices and wants Mr. Gary to explain quotes from the order including; "if... Willie Gary knew that Harsen had 'their case-closed files, with all that information, ...[Harsen] could find herself in a body bag...' and "Willie [Gary] is doing things that no other attorney has thought of doing and, believe me, he has himself covered." "Federal Lawsuit Charges Six Prominent Attorneys with Racketeering, Fraud & Legal Malpractice"
"Concert promoter sues former Atlanta Mayor Bill Campbell"
A Johns Creek concert promoter is suing his former attorneys, including former Atlanta Mayor Bill Campbell, alleging they defrauded him. The walls of Leonard Rowe’s Johns Creek home are a shrine to the musicians whose concerts he once promoted. 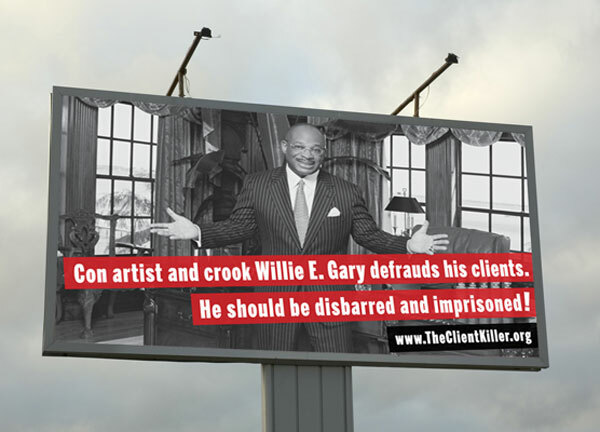 "Concert promoter files federal lawsuit against Stuart-based attorney Willie Gary"
"Concert promoter files suit against Stuart attorney"
A veteran concert promoter has sued Stuart-based attorney Willie Gary and five other lawyers, alleging they committed fraud and legal malpractice. 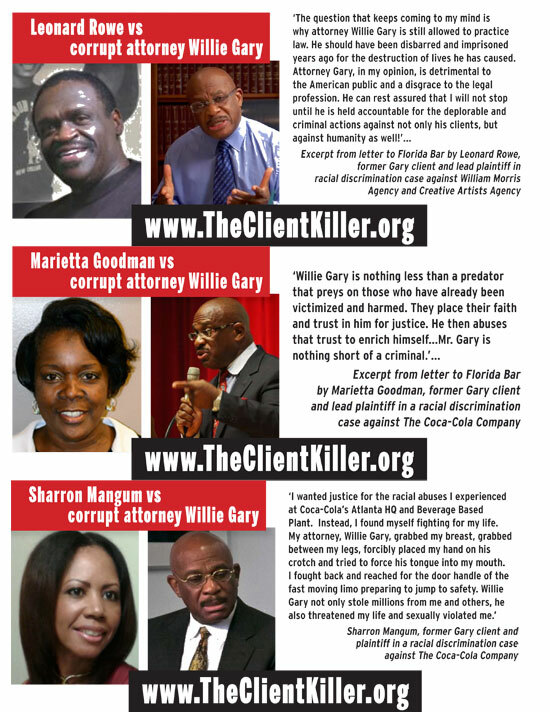 The lawsuit filed Friday in federal court in Atlanta said lead plaintiff Leonard Rowe and fellow promoter Lee King of Jackson, Mississippi, seek "to recover damages arising from the Gary defendants' fraudulent conduct in connection with their representation of plaintiffs and other black concert promoters in a civil action to redress...violations of civil rights laws committed by prominent talent/booking agencies and concert promoters controlled by white people." A news release from Kori Searcy, director of public relations for Gary, Williams, Parenti, Watson & Gary PLLC, said Rowe's lawsuit is nothing more than "an extortion plot" spearheaded by a former client. Also named as defendants are Gary's law partner, Lorenzo Williams; Gary's son, Sekou Gary, an associate with the firm; and former partners Tricia Hoffler, Maria Sperando and William Campbell, the former mayor of Atlanta. 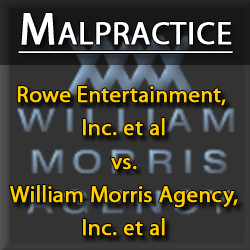 In 2005, court records show, Rowe sued the William Morris Agency, the world's largest talent agency, alleging disparities between black and white concert promoters in the entertainment industry. A federal judge in New York dismissed the suit in a summary judgment. Last March, that same federal judge found Rowe in contempt of court and ordered him arrested on suspicion of violating a permanent injunction and restraining orders by contacting the Morris Agency and its attorneys, and filing at least $1.4 billion in liens against them in defiance of a court order. Searcy said that because Gary's firm won a jury award of $16 million in compensatory damages and $23 billion in punitive damages in a tobacco case against R.J. Reynolds in July in Pensacola on behalf of Cynthia Robinson and her late husband, Michael Johnson, the firm has been the target of numerous unsubstantiated lawsuits. Noting that Rowe is a former client, however, Searcy also said, "In light of our ongoing professional duties to Rowe as his former counsel, we decline to discuss any allegations related to our representation of him or any information we learned during our representation." In a letter to the Florida Bar in March 2014, Rowe complained that "Gary has a pattern and practice of defrauding his own clients out of their settlements to enrich himself."